Wouldn't this be a fun sewing project? What an excellent way to use old swatches and fabric scraps! The West Elm pillow is created by stitching strips of colored fabric onto textured white fabric with one or two lines of stitching down the center of the fabric strip. This is quick and easy (thus the cheaper price) but could lead to frayed edges, gives the pillow a chenille texture. On the Anthropologie pillow, each strip of fabric is stitched closer to the edges, on both edges. This is twice the work, but should reduce fraying. Also, there is more space in the "gutters" between the rows of angled strips. 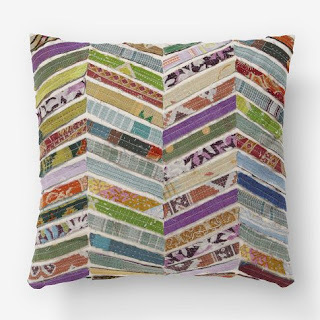 This calls more attention to the fact that the strips are appliqued on instead of patchwork, whereas the West Elm pillow could just as easily been constructed with four rectangles pieced together. I also like the sharper angle of the chevron effect, and I like how the addition of darker colors adds more contrast against the white. Fabric scraps, 7 or more different fabrics (15 is a good target). TIP: Make sure to include a yellow/gold, a red, and a turquoise/aqua fabric. This will help the overall random combination look cohesive. Include neutral, tan or beige fabrics to coordinate with home decor. Decide if you want 4 or 6 vertical stripes. Determine the width of each "gutter". Write this down. Determine the width of each "stripe". To do this, multiply the number of "gutters" by the gutter width (from step 2), then subtract that length from 18 inches. Divide that total by the number of stripes and you have your exact width for each stripe. Write this down. Create a template for your fabric strips. It's a parallelogram! On a piece of tagboard, draw two parallel lines (the width between the two lines is your choice, try a half inch?). Use the protractor to determine the degree of the angle you want, then draw an angle across one end of the parallel lines. Turn the tagboard piece so that the angle line you just drew is now a vertical line. Measure from that line with a rule the width of your stripe (from step 3) and draw another line bisecting both parallel lines. Now you have your parallelogram for your strip template. Cut it out of the tagboard. Trace it onto a scrap paper several times in the chevron pattern to see if it looks right to you. If it looks wrong, change your measurements or angles and make a new template. Get your template correct before you start cutting fabric! Using the rotary cutter and cutting board, cut out strips of fabric, perhaps 3 to 7 strips per fabric. Calculate how many pieces you need - perhaps 84 to100 strips. This is the fun part! Put all of the strips in a bag, then randomly take them out one at a time and arrange them in the chevron pattern (on the floor, table, or on an 18"x18" mat). When you are done laying them out, adjust a few pieces so your reds, yellows, and aquas are evenly distributed and make sure you don't have two of the same pattern next to each other. Mark placement lines on the white fabric using blue chalk. Sew the front and back together, add zipper on one edge. Insert pillow form and zip it up!